More choices and more training options in a traveling training theater & without any compromises. 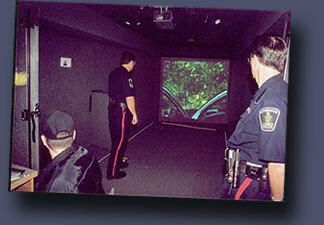 The Big Rush Inc Mobile Firearms Simulation Centre is the perfect solution for law enforcement organizations, security companies and Cadet Corps with training requirements in diverse areas. For large agencies it significantly reduces personnel transit time by providing training where the trainees are located. Our mobile judgmental, training and evaluation simulator goes anywhere. The Centre provides real flexibility by accommodating varying personnel throughput and weapons type. 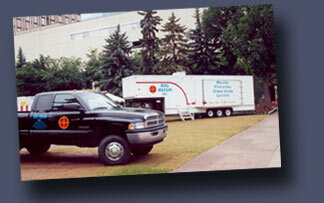 It is housed in a 36' gooseneck trailer that has expandable "wings" on each side expanding the Centre to 14’ wide. Mobile Firearms Simulation Centre is equipped with the Advanced Interactive Professional Range Instruction Simulator (PRISim) M1000 Laser-based system. This PRISim system features MultiTrac capability to handle up to three trainees at once. Available weapons include common semi-automatic handguns, and semi auto assault rifles. Other weapons can be ordered by special request. The M1000 also offers additional less-than-lethal weapons options such as OC spray, flashlights and batons. The M1000's unique laser-detection system provides accurate and immediate shot scoring. All weapons are modified to use Crown AirMunition,® a re-loadable compressed air bulleted round providing both realistic recoil and cartridge ejection. Magazine changes, and malfunction clearing drills are enabled as well.